Victoria BC, sitting at the southeastern tip of Vancouver Island, is the proud capital of British Columbia, Canada. It is located just north of Washington State's snowcapped Olympic peninsula across the Strait of Juan de Fuca. Everyone who lives in this vibrant city understands quite well why it is one of the most popular and fun Vancouver Island travel destinations in Canada. Victoria is also the major gateway to exploring the rest of Vancouver Island, which stretches close to 300 miles to the north. Over 330,000 people live in the metropolitan area, which is the largest urban area on Vancouver Island with The city centre home to approximately 90,000 people. The city's two main industries are tourism and provincial government administration. Other main areas include the Canadian Forces located in the township of Esquimalt, which is the base for the Pacific Fleet; and the University of Victoria located in the municipalities of Oak Ray and Saanich. Victoria is blessed with one of the most beautiful Inner Harbors. The regal Empress Hotel faces the Inner Harbor where guests and tourists can watch a never ending parade of sail boats, passenger cruise ships and ferries. As you stroll along the Inner Harbor you will be surrounded by Victoria's older buildings, Parliament buildings, museums and galleries. Victoria Is a Great Vacation Destination! There is something for everyone to do in the "City of Gardens," no matter your age or interests. Families, couples and individuals, whatever group you fall into, you will love Victoria and its people. 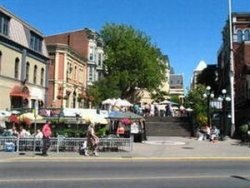 The streets of Victoria's old downtown area offer a mixture of old world British charm and the best of 21st Century comfort. There are dozens of shops inviting you to inspect their British woolens, Northwest native art, outdoor gear and a large collection of unique souvenirs. You can visit the shops on Government Street, check out the open-air craft market in Bastion Square, browse through Antique row and shop for anything you might need in the shops the locals patronize. At night, the area literally lights up when most of the buildings are outlined with strings of lights. The effect is quite charming and reminds you of earlier times in the city's history. No matter if you stroll the gardens and parks, walk the Harbor or breakwater, visit the museums, go to a spa or simply relax in the sun, Victoria has something for everyone. You can find unique dining to fit any budget at one of the numerous local restaurants offering a varied menu. Wherever you are in Victoria, you can smell the fresh sea air and the city has more hours of sunshine than anywhere else in Canada. It's the perfect place to hold hands with nature and see marine wildlife in its natural habitat; you will feel safe, free, and invigorated during your visit. People just seem to naturally slow down a bit here and no one seems to be in a big rush. Year round outdoor activities provide numerous adventures to choose from. It is no wonder Victoria has been declared the Cycling Capital of Canada . Many residents are able to cycle to work year round. 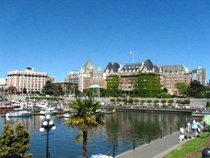 So, please browse through our website and find the details you need to plan an unforgettable holiday in Victoria BC. We'll be here to welcome you!